Is it too late to wish you a Happy New Year? Today is a New Moon - a psychological time for setting intentions, creating new beginnings, and planting seeds* . This is my first piece of writing for the website this year, and in the last three months I’ve made a fair few changes; this process of clearing and refreshing feels wonderful. I have wound down the Antique & Vintage side of my work. Whilst I do miss the thrill of the hunt, halfway though last year I realised that the perpetual search for rarer and rarer pieces at higher and higher prices was no longer bringing me joy. I had lost sight of why I went into jewellery in the first place; to create. Perhaps for many artists the cyclic pattern of idea, gestation, labour and culmination fulfils some deep human instinct. Or perhaps I’m just weird. In early January I closed my Etsy shop. After four and a half years and almost 1000 sales via that platform alone, it was with mixed feelings but I know it was the right decision. A dilution of the Etsy marketplace by imported goods which are clearly not handmade, a strange hierarchy of promoted listings, less transparent search criteria and drastic increases in fees meant that the situation became untenable for me. As part of the shop closure process, Etsy asked for feedback, so I politely shared my reasons for leaving and requested a response. I but never received one. Perhaps this is Indicative of what so many online selling platforms have become. For the foreseeable future, I now sell exclusively on my website. So far, it seems to have been absolutely the right decision. 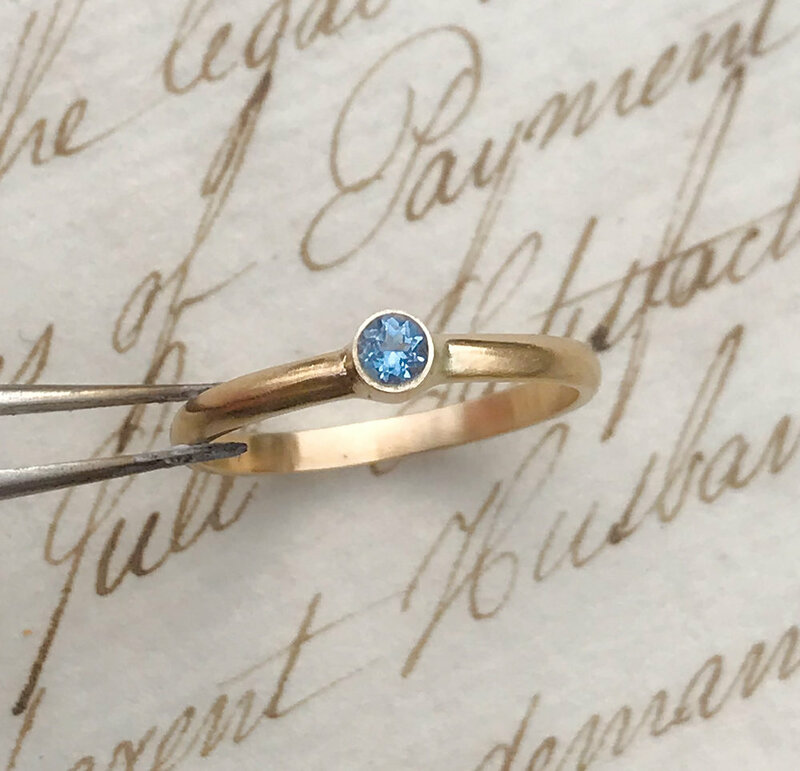 From our new made-to-order Rainbow Birthstones collection, a sparkling blue aquamarine (for March) set handmade 9ct yellow gold. I now focus just on custom and bespoke work, my own handmade work, hosting workshops and teaching. I plan to expand my involvement in all of these through 2019 and beyond! Already this year I’ve seen a jump in custom orders. I have ten on the go at the moment. Already this year I’ve seen a huge surge in workshop bookings. To date (March 6th), I’ve had thirteen confirmed bookings which cover Make Your Own Wedding Rings and One-Day Beginners’ Workshops. 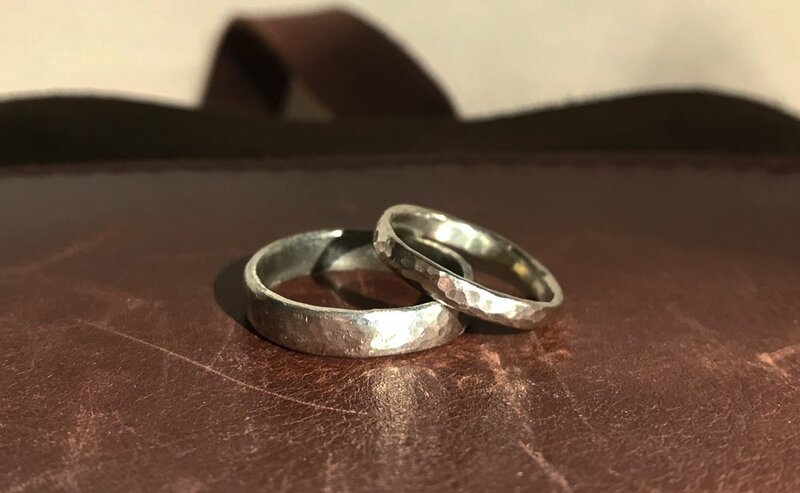 A pair of wedding rings in 9ct white gold, handmade by Charlotte and Darren from their Make Your Own Wedding Rings workshop with us at the end of February. I’ve newly introduced the #fridayatfourdrop on Instagram, where I release what I’ve been working on that week in the Shop Our Jewellery section. Each week for the last three weeks the collections have sold out. 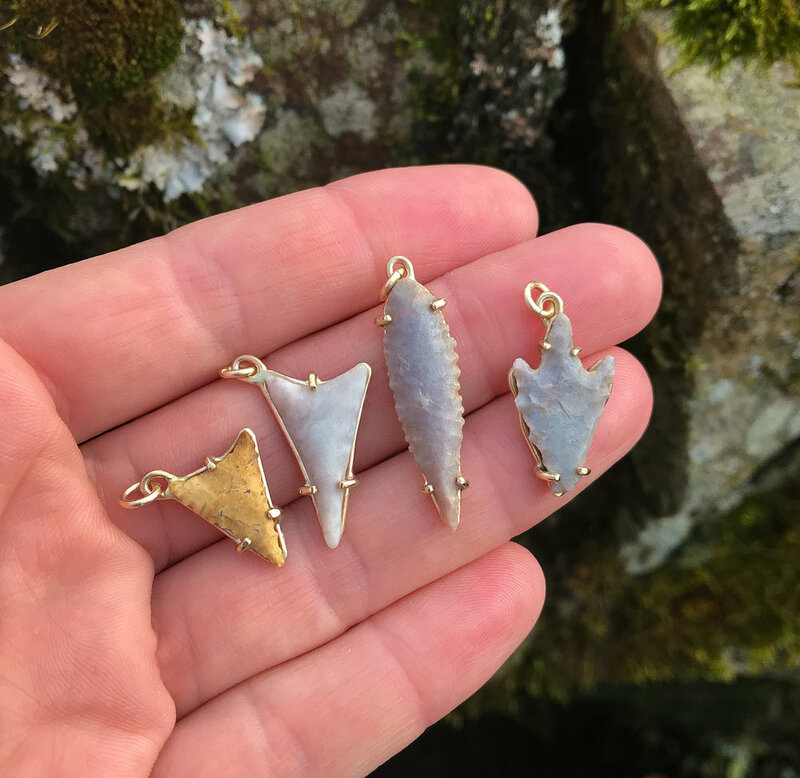 Neolithic Saharan arrowhead talismans, dating from c.4000BC, set in recycled 9ct yellow gold. From two of our recent #fridayatfourdrop posts on Instagram… and all sold out. Being self-employed, I spend a lot of time brooding on the future, and what may (or may not) happen. Will people get bored of what I’m doing? Will the interest drop off? Will trends change? It can be very unpredictable, worrying, and frightening even. 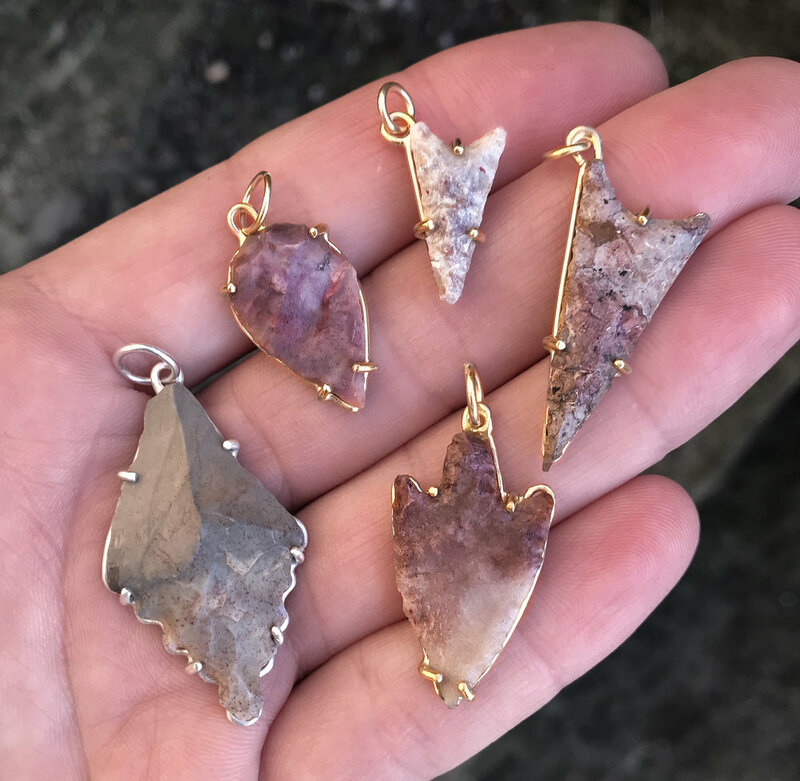 But I have a good feeling about 2019, and where it will take me and my micro-business. The 6th April will mark Hannah Peters Jewellery’s six year anniversary! I want to express my deep and sincere thanks to every single person who has ever supported me - in any way - since I began this mad little enterprise. It’s been a ~journey~ but with your engagement and support there’s no reason why it shouldn’t continue. Thank you. All the colours of the rainbow! Choose your favourite in our Rainbow Birthstones collection. 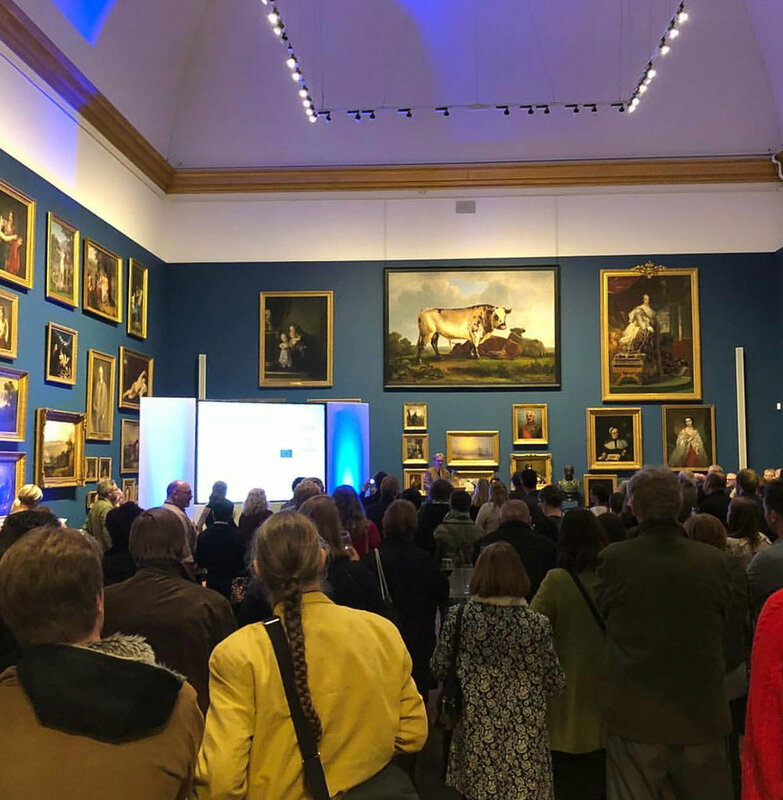 Two weeks ago today, our #Untitled10 exhibition opened at the Bowes Museum in the old market town of Barnard Castle on the edge of County Durham. A great turnout as Matthew Read, Director of the Bowes Centre, gives an overview of our project. This project has been part of my life for over 8 months now. I hadn’t realised it’d been that long. I attended a briefing day waaaay back in March in the teeth of the worst winter I can remember, and spent the blistering summer thinking about it, working on it, developing it, testing it. And now - suddenly - it’s all over. I taught myself the traditional craft of sand casting through trial and error. Once I’d sourced and set up all the equipment - including a specialist oxy-propane casting torch - it took me six attempts to successfully cast a passable figure in fine silver. I went behind the scenes at the museum, into storerooms and up to the high attic archives, and had complete creative freedom. I found almost an exact copy of the necklace which Pradier’s figure of Sappho is wearing - an antique Victorian silver collar - which is now in my personal jewellery collection. I cut up a book of Sappho’s poems and burnt the remainder; a kind of smoke-offering of thanks. I created a 100 page reflective journal, filled with collage, embroidery, feathers, tissue paper, antique Victorian scraps and a mirror of real silver. I included my treasured cuttings of Tim Walker’s photoshoot of Lily Cole in India which I’d saved from the July 2005 issue of Vogue, interspersed with fragments of Sappho’s poetry. I ended up listening to the same songs over and over again - you can find my playlist silvered on Spotify. I transported my real jewellery bench, the one which I’ve used everyday for 14 years, to the Silver and Metals Gallery of the museum. It’ll remain there until January next year. I met some wonderful, deeply creative people. In the museum, if you look at the text on the wall just next to the statue of Sappho, you’ll see a quote from Benvenuto Cellini, a renaissance metalsmith, which reads “…I completed my work in a style which did me the greatest credit. Next I set about to cast it in bronze…Suffice it to say that the figure came out splendidly, and was as fine a specimen of foundry as had ever been seen…”. 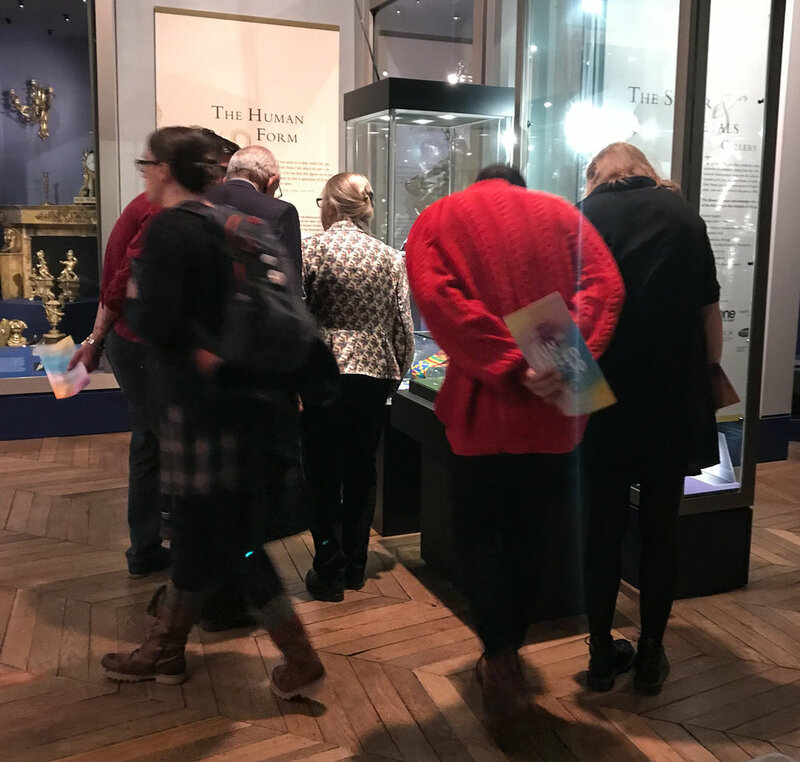 When we see beautifully curated museum displays, especially in this particular gallery here at the Bowes Museum, every single object is finished, polished, perfect, clean. We can’t see any evidence of the actual manufacturing process; it’s as if the objects have appeared suddenly, miraculously, and fully formed. 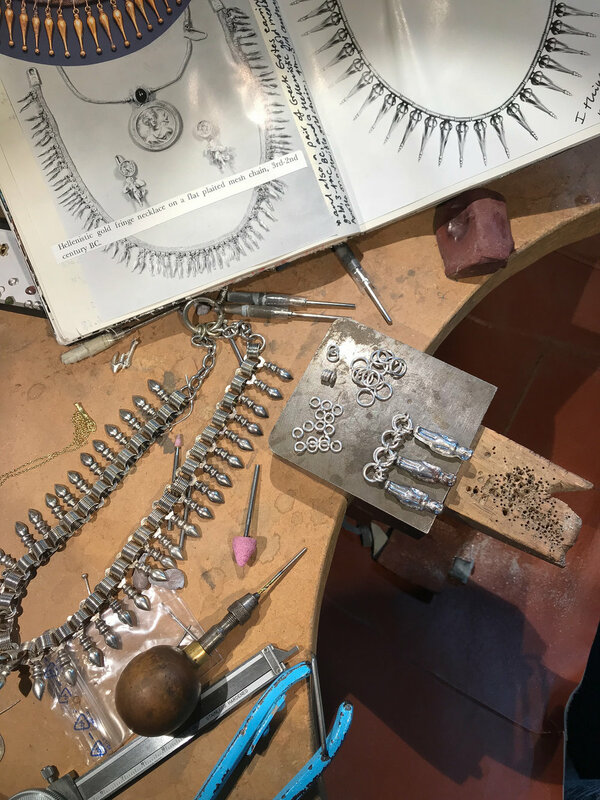 As a jeweller and silversmith, I know first hand that the creative and developmental processes used by metalsmiths, founders, and casters can be extremely grimy, dusty, uncomfortable and noisy. There are prototypes, practice-runs and maquettes; chemicals, oxides and acids. Inevitably there is a very fine layer of metal-dust all over everything in the studio, necessitating the use of protective goggles and face masks whilst at work. Cellini makes it all sound so easy and instantaneous, so I decided to take this as a direct challenge! Over the summer of 2018, I taught myself the traditional technique of sandcasting. I based my work on the solid silver figure of Sappho by James Pradier, since she was also manufactured by casting. I took the existing fragments of Sappho’s poetry and pieced together a reflective journal which documented my mind-journeys, creative processes and practical experiments, the hypothetical culmination of which would be a classical-style necklace made from hand cast solid figures. I thought it would be an interesting concept to install my actual jewellery bench in the Silver & Metals gallery. This is my ‘real’ bench, which my father made for me when I was starting out as a self-taught jeweller in 2004. It’s very simple, and was made from off-cuts of wood and bits of MDF. The tools on the top surface are my real tools. The crucible-holder and crucible are the real things I used when I made the silver figures in the nearby display case. The worn and dirty bench beg has been used for 14 years and is testament to hours and hours of work at my bench. I seek to ‘deconstruct the museum’ and show that creative developmental processes have a great deal in common with everyday ways of living and working, like those which take place in the family shed, our friend’s garage, or neighbour’s barn. Who are the Other Nine Artists? You can see the creative and developmental work of the #Untitled10 collective at the Bowes Museum from 9th November 2018 until 11th January 2019. If you follow us on social media, you’ll know that during the summer Hannah has been working on a very exciting project… and this project has finally reached it’s completion! Yesterday, Hannah travelled over the moors with her car packed with all sorts of things - including one very big thing - to deliver her work for a wonderful exhibition which opens next week at the Bowes Museum. In spring 2018, The Bowes Centre, in collaboration with The Bowes Museum and Durham Creatives, invited proposals from artists and makers to investigate the Museum, its collection, building and immediate environment. This open-call was specifically designed to encourage the expression of experimental and developmental practice. Over 230 artists applied. Ten were selected. These are now collectively known as #Untitled10. The Bowes Museum is a nationally important decorative and fine arts collection, housed in an imposing building which opened 1892. The building, park and its collection were the philanthropic vison of founders John and Joséphine Bowes. Bowes houses over 15,000 founders’ objects. Almost every object is a finished work. Each has a story to be told. The #Untitled10 challenge was using Bowes as inspiration, to communicate the creative process that lies behind all work. Central to the commission was there should be no finished work; only process. Artists responded to individual objects in the collections at Bowes, to associated objects such as the monkey-puzzle tree and the sense of physical and emotional historic space, all connected by John and Joséphine Bowes’ bitter-sweet story. Throughout the summer of 2018, #Untitled10 developed their projects and now tell their personal and professional journeys, of materials, making or manufacture, of creativity, experimentation and development, of failure and success. The exhibition runs from Friday 9th November 2018 – Friday 11th January 2019, at the Bowes Museum in County Durham. The fabulous chateau-inspired architecture of the Bowes Museum in the market town of Barnard Castle, County Durham, in the wintery afternoon light of delivery day. These have been in the pipeline for a loooooong time and we’re so pleased to share them with you, just in time for Halloween! Our beautiful Fledermaus ring is named after the German word for ‘bat’ which literally translates as “Flitter-mouse”. 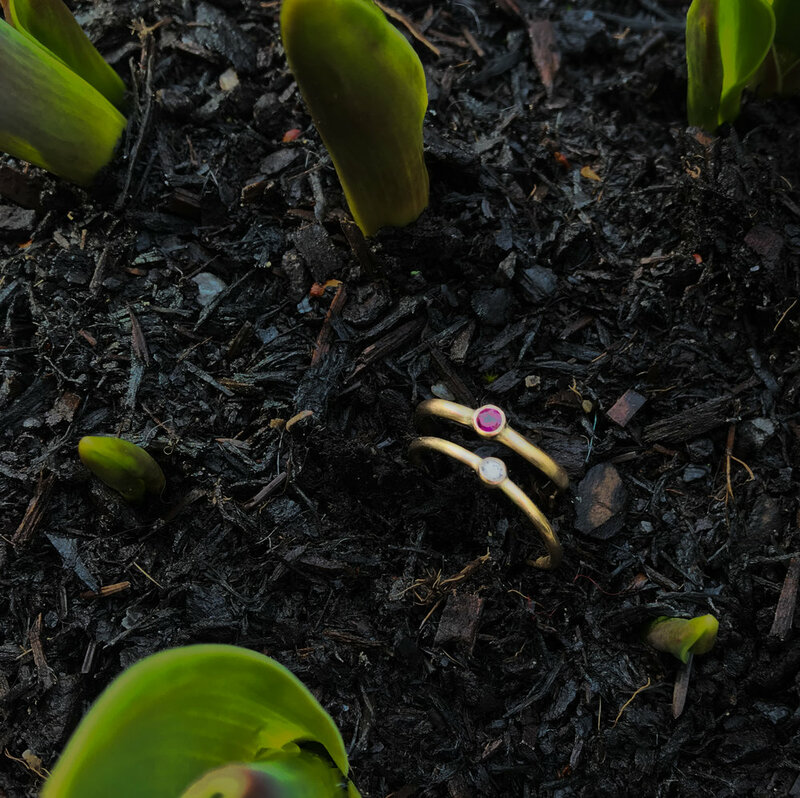 Our Fledermaus rings are all cast directly from an antique mid-Victorian ring from Hannah’s personal collection. We use a slightly different casting technique for these rings (as opposed to sandcasting) to enable us to highlight the beautiful details of the bat’s ears and wing-bones. The bat is wonderfully 3D and is positioned with her wings and tail outstretched, as if she is launching herself into flight directly from your finger. She has long pointed ears which are pricked and alert. Her wingspan is 2.0cm, and from the tips of her toes to the tops of her ears she measures 1.2cm. Available in any ring size from UK size H (approx US size 4) up to UK size V (approx US size 11). The price is the same for all sizes of the sterling silver Fledermaus ring. Please just let us know which size you need and we will make one to your size. Maximum lead time is normally around 2 weeks, depending on our workload. We only decided to do this at 4pm the day before...but we were had vistors nearly all the time from five minutes after we opened until late afternoon, which was a real surprise considering where we are! The weather was against us in the evening with only a couple of callers, but nevertheless it was a really fun day. We had on display the first bench-fresh Teeny-Tiny series pieces from our Wild & High collection in fine silver and 18ct yellow gold. These are individually hand-cast by Hannah from life (or rather...death) and are seldom larger than 1cm long. We also raided our archives to show off a tempting selection of handmade sterling silver and gemstone pieces. But most of all, it was wonderful to be able to show off our beloved studio with fresh garden flowers, cups of tea and glasses of wine, and just to hang out with lovely people and talk about jewellery! Keep an eye on our new EVENTS CALENDAR where we'll be sharing details of our Christmas Open Studio. We'll have on display a handpicked selection of affordable sterling silver jewellery, perfect to give as gifts (or of course as a treat for yourself!). Prices will start at £15 for handmade sterling silver stud earrings, and rise to around £300 for a statement necklace, with everything else in between. We'll also have a very limited number of gold and precious gemstone pieces, as well as hand-picked antique and vintage jewels to tempt you. Our studio and garden will be transformed with fairy lights, candles and (weather permitting) outdoor braziers, and there'll be edible wintery treats, wine, mulled cider, and hot drinks to wash down any purchases and to keep you toasty!